In his inaugural Hearthside Chat appearance, Chad "Celestalon" Nervig introduces us to the League of E.V.I.L. and shows two new Warrior and a Warlock card. We also learn that the 5 Lackeys shown in the announcement video are all Lackeys we'll get for Rise of Shadows. More of them will be recruited in the upcoming expansions. Card images are a courtesy of Hearthpwn. Omega Devastator wil be a good addition to a mech warrior deck. I expect to see a control oriented one, carried by Dr. Boom, Mad Genius in late game. Then, this card will be strong too. Really nice to get from Omega Assembly, can be magnetized, and etc. I like it. Improve Morale is more situational. It is a really nice Execute activator, with a nice effect. Reminds me of Slam and Blood To Ichor, both of which saw play in various warrior decks in the past. This will too. Probably one copy, maybe even two, depending on the archetype. Rafaam's Scheme is not very strong I think. Also depends on what kind of board buffs warlock gets, but its effect doesn't seem really exceptional to me for a card you probably have to keep in your opening hand. To be strong, I think it has to summon at least 3 Imps. Now, I don't know how Schemes work, but if they are upgraded at the beginning of your turn, this card makes a good turn 3 play if it was in your opening hand. Omega Devastator is a strong card. Insane with 10 manacrystals, but if you need to play it before 4/5 for 4 mana is fine too. The Scheme completly depens on HOW it will upgrade. Will it upgrade to 2 x 1/1 then 3 x 1/1? Or 2 x 2/2 and 3 x 2/2 or something like that? But I guess it won't be a great card. Omega Devastator is good but not too much. Yes, it's very nice, but you still need to wait until turn 10. 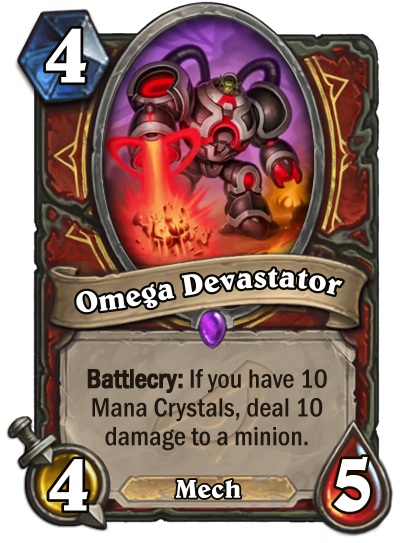 This means that this card will be played if both 1) there exist a control mech warrior based on Dr Boom mad genius, and 2) the meta is slow enough to accept another omega dead-until-turn-10 card, as that control warrior will have the omega draw 3 mech card. However, Omega Devastator is very nice when pulled from Omega Assembly and from Dr Boom hero power, and this is surely improving the mech pool. 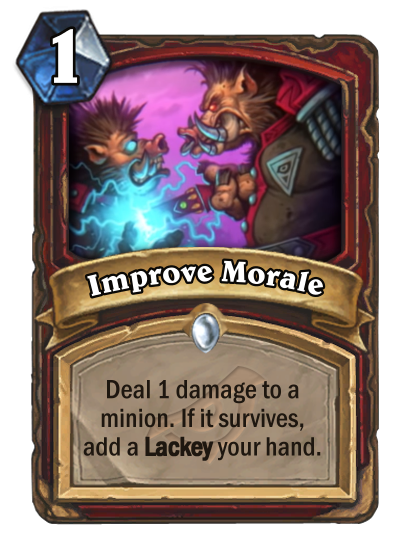 Improve Morale isn't that good imho, if there isn't some super strong lackey synergy. You should play better things to activate execute. 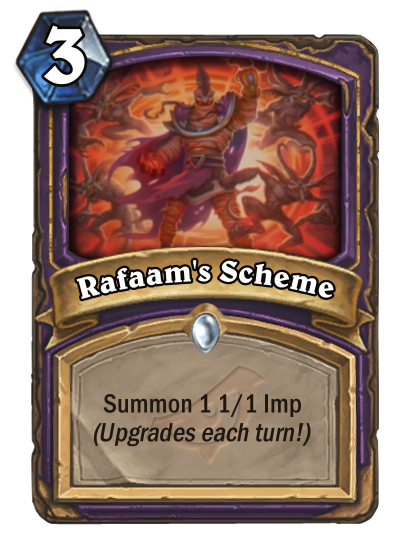 Rafaam scheme is trash, unless some kind of aoe buff, better a +1/+1 then a only attack one, will be printed. In that case, it will be nearly OP. They won't, not in this set at least. The Scheme﻿ completly depens on HOW it will upgrade. Will it upgrade to 2 x 1/1 then 3 x 1/1? Or 2 x 2/2 and 3 x 2/2 or something﻿ like that? But I guess it won't be a great card. 2 1/1, 3 1/1 and etc. 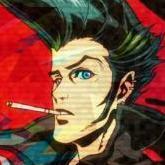 So there will be one callback card per villain. We already know Rafaam himself (Golden Monkey, back from League of Explorers), Forbidden Words for Madame Lazul (The Forbidden, back from Whispers of the Old Gods) and now Omega Devastator for Dr. Boom (Omega, back from The Boomsday project). Anyone wants to bet on what we will get for King Togwaggle and Hagatha? King Togwaggle is from Kobolds & Catacombs. In that expansion, we had Legendary weapons, Spellstones, Unidentified items and Rogue secrets. Legendary weapons and Spellstones already form complete sets (one for each class), so I don't think they will be the callback. I would bet on a new Unidentified item (there was none for Rogue so far) or a new Rogue secret - they don't have many, and this is King Togwaggle's class so it would fit nicely. Hagatha is from The Witchwood. It seems reasonable to rule out any even/odd card, as they will move to Hall of Fame at the same time Rise of Shadows will be available. The other mechanics for this expansion were Echo and Rush. Shaman had neither of these back then. Rush does not really fit with Shaman though, so my uncertain bet would be on a card with Echo. There were also minions shifting attack and life while in your hand, but I don't think they saw much play, so I doubt Blizzard would make another. It is worth noting that so far the known callback cards reuse old mechanics which did not have a dedicated keyword in the game itself. My bet for King Togwaggle matches that trend, but not the one for Hagatha. My boss has no problem if we use the Internet in some spare minutes - but I guess he wouldn't be thrilled if we started watching videos. A new secret for rogue isn't good at all, if there aren't at least other 2 or 3 secrets to make what you play... well, secret 😛 if your argument is right, I bet on a unidentified item. However it is good for the game mechanic, less for the lore (while it's clear why Boom takes a big mech with him, and why Azul uses the forbidden magic of the Old Gods, it's unclear why Togwaggle should take an item without knowing what it is!). So my bet is on something more lore friendly, like a treasure card. For Hagatha, an echo card or something that generates random spells. I don't understand why Hearthstone has a problem of doing accurate portrayals of the quilboar. First it was Biker Pigs from Mars and now this... what the hell is that? it's unclear why Togwaggle should take an item without knowing what it is! Oh, you are right. I totally forgot that the other Rogue secrets are cycling out soon, thanks for pointing it out. So it can't be a new Rogue secret. It would have to be at least 3, but then it would break the "one villain, one callback" pattern. Honestly I think all three of these cards are a little meh. The mech is a great tempo play on turn 10, but that really isn't where tempo plays are particularly impactful. Still good at 10 mana, but I don't think its good enough to include a yeti in your deck the rest of the time. Plus warriors already have shield slam and execute. Improve morale seems pretty meh. Looks to be a worse blood to ichor (A card that often felt like the worst card in most warrior decks) in both tempo and control warrior decks. Feels like a 2/2 in control is still better then 3/5 of the lackeys, and the extra board presence immediately is what tempo wants. Still might see play since some of the better execute enablers are leaving standard, notably blood razer, but really, just play slam or cruel task masker, seem better. I will say, if warrior ends up with some sort of lackey synergy this card becomes much much better. So it isn't completely hopeless. The scheme is completely hopeless. A 3 mana spell that summons 4 1/1s would not see play, and I personally think even at 5 imps it is at least slightly below the curve. Edit: On further consideration, the omega devastator is probably good enough to see play. A turn 4 yeti is pretty strong vs a lot of the tempo style decks and this card is really good late game. Still don't think it is amazing, but I do think that with D boom giving mechs rush, that this card is definitely on or above the curve in terms of power level. Honestly I think all three of these cards are a little meh. Much things of this expansion will be meh, IMHO, for a clear choice of Blizzard of lowering the cards' power level. If you think about it, all this 3 cards are trash without some external support: the scheme needs some kind of druidly aoe buff, the morale some lackey or enrage support, and the devastator needs a slow control shell to work. And other cards in this set are build with this mindset too: Rafaam in person is strong or not based on the legendary pool, that is based on what they'll print in this expansion and in the next two; but I don't remember the Raven's pool to be that strong. Surely in wild the legendary pool is almost trash, based on the fact that the Golden Monkey is now trash too. And Swampqueen is again based on a slow meta idea that may or may not be true. Some people compare her to kazakus, but you must remember that Kazakus was a 4 mana minion that could give you fast options as well (1 mana potion was huge against aggro at turn 5, while 5 mana potions often gave you the tempo/time needed to stabilize) while Hagatha is only slow. In fact, the powerlevel is lower, at least for now. I won't be surprised at all if some kind of super aggro face deck will arrive out of nowhere and take the meta to some kind of "deat by turn 5" place. I could be wrong as I'm still pretty new to the game, but isn't it always the case with the first expansion of a year? With 3 expansions cycling out of Standard, the "competition" with existing cards in this format is much lower than when they release the last expansion of a year, so they can set the average power level lower too. I wouldn't complain. If they wouldn't do this then we would have a never ending arms race, only the latest few expansions would be played, and the newest cards would be so powerful that there would be no room left for strategy, be it in deck building or game play. Personally I'm much more interested in new cards that will have a good value if put in the right deck and played right, than new cards that are so overpowered that everybody will want to open or craft them on day one and put in all of their decks unconditionally. Did you ever played yu-gi-oh? I was a good player in that game before switching to hearthstone, and I did it exactly because in yu-gi-oh it is an endless arm race where always more OP things appear while a ban list totally murders the older list that can compete. So, I wouldn't complain too. But for example, in the last year the Witchwood was very meta defining, it was the more meta defining of the 3 raven's expansions, and it was so meta defining that the core cards of that set are rotating one year earlier. Instead, the Mamooth year (or whatever it is written, sorry) was nearly as you describe it: while Un'Goro was a good expansion, KotFT was a lot stronger, and KnC was even better combined with the last one. For me, the perfect year is still the Kraken: one very good expansion in Whispers, a not so expansive adventure with powerfull cards to change the meta, and a last expansion with something stronger that will live the least time in standard. You can argue about the power level of some cards like jade idol; however, it was a good designed year, and it is proved by the fact that almost every concept in that year was strong and meta sooner or later (everyone of the 4 Old Gods were played in t1 decks, 2/3 crime families too and instead of the third, there was the pirate family).